Pit bulls are loyal companions but demanding to keep. They have a lot of energy which is useful for keeping themselves entertained but can be destructive for your furniture and your shoes. You’ve probably purchased numerous toys for your pit bull but they’ve shred them all to pieces by now. What you need is an indestructible chew toy that’s designed to withstand the rigors of a pit bull’s powerful jaw. The following is a review of the strongest chew toys for pit bulls that are made from durable and long-lasting materials. 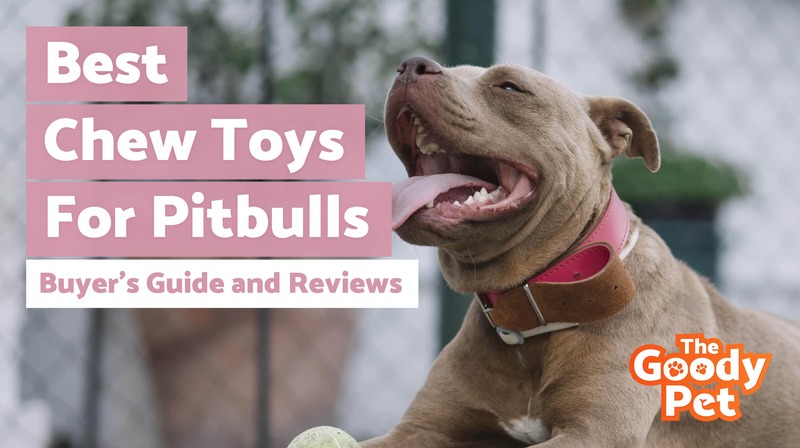 Afterward, we have a guide with all the information you need to find and purchase the best pit bull chew toys for your furry best friend. Your dog will go nuts for this indestructible chew toy from GoughNuts (see what we did there?) This brand is a firm favorite among pit bull owners and for a good reason. You won’t find a better toy maker for pit bulls and this one is no different. This toy is made from a sturdy rubber material, which is reinforced with carefully engineered carbon. It will give your pet hours of entertainment thanks to its unique rounded shape, which makes for a great game of tug-of-war. Plus, there’s a red safety indicator to let you know when it’s time to take the toy away from your dog. This toy was made for aggressive chewers with strong jaws and teeth. It’s made from a practically indestructible rubber material that has been reinforced with carbon, and your pit bull will love its fun shape. Dog lovers know the Kong brand very well because it’s one of the most reliable dog toy manufacturers around. They’re known for creating chew toys that can withstand the elements and the test of time. This dental chew toy lives up to that reputation. Not only is it practically indestructible but it’s safe and healthy for your pup to chew on. That’s because it’s made from a kind of natural rubber that is completely non-toxic yet remarkably hard-wearing. The best part about Kong toys is the fact that you can stuff them with toys to make playtime even more exciting for your pit bull dog. Another reason why dog owners love Kong toys is because they’re easy to clean up after and they’ve been known to reduce separation anxiety because they represent a reliable constant that will comfort your dog whenever you’re away. If you’re looking for a powerful chew toy that will stand up to constant pounding and tearing from your pit bull, this is a great option. We love the fact that Kong was able to balance quality and price pretty well with this toy. Plus, you can stuff it with your pup’s favorite treats like peanut butter, kibble, and even frozen yogurt to add more excitement to play time. Not only is this chew toy from Benebone shaped like a wishbone but it has the flavor of bacon. That’s not to say that it’s meant to be eaten but your dog will spend hours enjoying its delicious flavor while trying to chew at it. It’s made from durable nylon and it’s available in other flavors other than bacon, including chicken and peanut butter. Your pit bull will have the time of his life chewing through this indestructible toy, whose wishbone shape makes it comfortable and even pleasurable for dogs to chew. It’s worth noting that this toy is larger in size than the other toys on this list and it comes at a very attractive price point. We love the fact that this toy comes in different flavors because it adds an element of unexpected fun for your dog, and it’s made from real food ingredients with no artificial flavors or chemicals. Pit bulls like their toys tough and easy to play with. The Monster K9 dog toy satisfies that desire with this durable dog ball that comes with a lifetime guarantee which shows that it’s really made to last. You’ll be glad to know that it’s made from natural rubber that’s not harmful to your pup and it’s perfect for playing catch. The interesting thing about this toy is that it’s shaped like a ball so it’s not a traditional, squishy chew toy, but your dog will love playing with it nonetheless. The only downside is that this ball doesn’t float so you can’t play in the water with it. This is one of the most resilient toys on this list and it comes with a lifetime money-back guarantee to back it up. It’s definitely made for aggressive chewers who also enjoy a game of fetch every now and then. Elk Antler natural chew toy is a pricey but rewarding option. This long-lasting chew toy is made from all-natural, odorless and non-synthetic antlers. It’ll keep your dog stimulated and engaged for hours knowing that just below the surface of the hard exterior is some delicious bone marrow. This is not an indestructible toy because your dog will eventually get to its center to enjoy the treat hidden within, but it can last for months and even a year if your dog takes his time chewing it up. Most dog owners opt for the largest size because it takes longer for pit bulls to chew through it. Just make sure to keep an eye on your dog while they’re chewing this toy because there’s always a chance that a small shard could break off from the antler and cause a choking hazard. The Elk Antler chew toy is available in a variety of different sizes and dogs enjoy it because of its taste, smell and shape. West Paw’s Zogoflex Hurley chew toy comes with a slot for you to stuff treats inside that will keep your dog busy for hours on end. This toy is made from non-toxic, BPA and phthalate-free materials that are 100% safe for your pit bull dog to chew on for as long as it likes. Not only does it have an unpredictable bounce, but this toy floats in water and it’s dishwasher safe. If you like, you can even fling it while playing and it’ll withstand constant chewing with no problem. It’s available in a wide range of fun colors that include orange, aqua blue, granny smith green and black. This is one of those toys that’s perfect for solo and interactive play alike, plus it is 100% guaranteed against damage so no amount of chewing will destroy this toy. The company will even pay you back if your dog happens to chew his way through this toy. This is a non-toxic chew toy that’s guaranteed against dog damage; that’s not something you see every day. It’s easy to clean because it’s dishwasher friendly and you can stuff treats inside the large receptacle in the middle of the toy. Petstages introduces a toy that’s designed not just for fun and games, but with your pup’s dental health in mind. It’s constructed from a combination of durable synthetic and wood material that’s guaranteed to withstand rigorous chewing. Of course, this means that a piece of the toy could always be stripped away causing a choking hazard, but other than that this toy is designed to keep even the most demanding pit bull happy for a long time. Be sure to keep an eye on your pup while they’re playing with this toy and remove it immediately if you notice a piece of it breaking off. Made from an innovative combination of materials, this toy is a one-of-a-kind design that’s made to satisfy even the most demanding chewer. It’s made to keep your pit bull dog’s teeth healthy while keeping them preoccupied. We all know that pit bulls are highly energetic and enthusiastic players, so it’s no wonder that they need special toys to play with. Preferably it should be something stronger than the average toy, with the ability to withstand aggressive chewing. First of all, it’s important to clarify that all dog toys will eventually succumb to constant chewing. But, it’s a matter of extending their lifespan through thoughtful design and the use of strong, high-quality materials. What you want is a toy that can withstand constant chewing for extended periods of time so that you’re not out buying a new chew toy every month. After all, a chew toy should be intriguing to your dog so that they keep coming back to it. It needs to be challenging and engaging at the same time, and that’s what most chew-resistant dog toys offer. Size is another important factor to keep in mind when looking for a pit bull chew toy. Ideally, you should opt for the largest available size, considering the fact that pit bulls have large jaws and you don’t want a small toy that your dog can potentially choke on. Likewise, if you have a pit bull puppy, it is better to get a smaller sized chew toy instead. Here’s a list of all the essential items that you need for your new pit bull puppy. Manufacturers use all sorts of materials to make chew toys, and some are better than others. The best choice for your dog should be a material that’s sturdy and safe enough for your dog to chew without posing a health risk. Look out for things like sharp edges or poor paint job and flimsy materials that disintegrate or chip off easily. The last thing you want is for your pit bull dog to get injured while playing with their chew toy. Plus, you should be able to leave your dog to play and enjoy their toy without too much supervision. It’s very important for pit bull dog owners to pay attention to the level of safety offered by the toy they purchase for their pup. Some chew toys are unsafe because small pieces of the toy can break off and choke a dog to death, while others can even lead to intestinal blockage due to their size. That’s why you should look for a large-sized chew toy that your dog won’t be able to swallow, and this takes bouncy rubber balls out of the picture. Remember that pit bulls are large and aggressive chewers by nature so you can’t buy them the same toys you’d get for a Chihuahua, for example. But size alone won’t protect your toy because even large toys can be dangerous if they’re made from inferior materials. Keep an eye out for jagged edges or sharp corners that might cut your dog’s lip. Rather opt for a toy with soft edges, which is common with balls, rings, and stick-like toys. Edible chew toys can sometimes break off into splinters which is obviously hazardous to your pup’s health. Be sure to look out for this, especially with cooked bones and antlers. Your dog’s safety is paramount and if it means you have to spend a little more to guarantee their safety, don’t hesitate to do so. For younger pit bull puppies, it is recommended to consider getting specialized chew toys that are more suited for their development stages. There’s nothing more satisfying for a pit bull than playing with a toy that’s engaging, challenging and durable. It gives them a sense of adventure to know that they’re up against this virtually indestructible object that also happens to have an interesting shape. The key to a long-lasting chew toy is a combination of high-quality craftsmanship, using the right materials, safety and durability. Extras like being able to stuff treats inside, different colors and flavors are also nice. One toy that meets and exceeds these requirements is the Goughnuts Indestructible Chew Toy. It’s made from a sturdy rubber material that’s designed to keep your dog entertained while maintaining good dental health. It has a simple, safe rounded design and it has a proven track record for being a fun and durable toy that your pit bull pooch can grow up with. We particularly like the red indicator button on this toy, which is meant to let you know when to take it away from your dog. This is a great safety feature that will protect your dog from harm.